"Protecting the source, inspiring the future" In this workshop, Michael will give an introduction to "Apis Arborea" and share innovative gestures within the biodynamic field of apiculture — among them the framework of an indigenous, arboreal apiculture and LocApiary, a vision of a local watershed apiary. 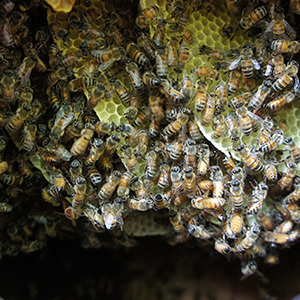 Rewilding and the restoration of natural honeybee nest habitat are part of an effort to further develop a biodynamic paradigm of apiculture. In this context, we will also evaluate the international Demeter Standard for Beekeeping in a historic critical context. The accelerating loss of animal species and biodiversity reflects the urgency needed to move towards preservation and a systems-oriented approach. The framework of Apis Arborea is one of honoring and protecting the essential role of honeybees in sustaining life on our planet while preserving their life and fostering environments conducive to their health and dignity. This workshop attempts to move beyond a binary approach in our exploration of the apian matrix of life and to think literally "outside the box". Michael will share various aspects of his work, among them examples from current rewilding projects, as well as the craft of arboreal apiculture and bee-centric strategies for a holistic apiculture.